Apprenticeships provide a way of learning while earning, as well as helping apprentices into work by equipping them with the job specific skills employers’ value so highly. They are also seen as so key to improving productivity and tackling youth unemployment that the government has set a target to provide 3 million apprenticeships by 2020. 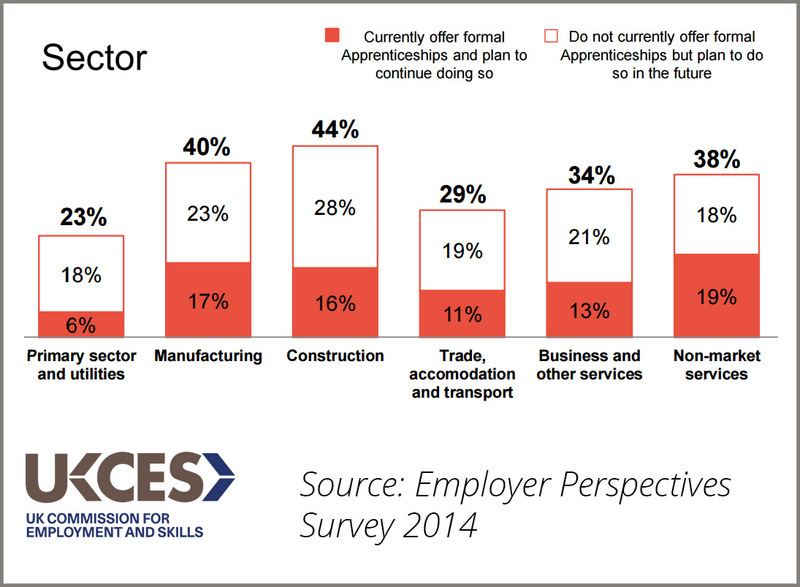 Last year we looked into which employers were providing or intended to provide apprenticeships. We found that 88% of employers who currently offer formal apprenticeships plan to continue to do so and 24% of employers who do not currently provide apprenticeships intend to do so in the future. According to our interviews with employers it is the manufacturing, construction and non-market services sectors which are leading the way; in all of these areas approximately 2 fifths of employers are offering or plan to offer apprenticeships. All sectors are set to see an increase in the number of employers providing apprenticeships, however the increase might not be as great as these figures suggest. To see why you’ll need to read our full report, in which we ask employers about the barriers to offering apprenticeships. If you want to know more about apprenticeships or have questions about this stat, tweet us @ukces or leave a comment below. I recommend an apprenticeship to any young person – go for it!